Mercedes Benz is planning to launch the premium C63 Coupe in the Indian market. This will add to the C-Class vehicle range which includes the likes of the C43 AMG, C63 S four-door and C300 Cabriolet. 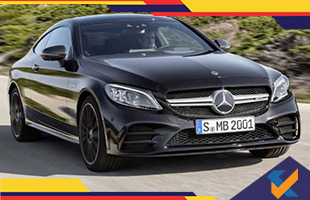 The Mercedes AMG C63 Coupe will be competing with the newly introduced Audi RS5 and BMW M4. It will be a rear-wheel drive offering like its primary rival, the M4, and will be the first coupe body style product in India from the C-Class range. The updated S-Class and last generation E-Class both have coupe body styles available in India already. The Indian version of the Mercedes AMG C63 Coupe will get a 4.0-litre bi-turbo V8 engine that dishes out 503 BHP and 700 Nm. India will receive the S version of the car and the engine will hit 100 kilometres per hour in 3.9 seconds. The Mercedes AMG C63 Coupe will have a top speed of 290 kilometres per hour. There will be a 2 + 2 configuration for seating inside and a large infotainment screen. The interiors can be customized based on buyer preferences. There will be panoramic or carbon roof options available along with rear limited slip differential as standard and driving modes. There will also be an active exhaust which can be activated through a central console button.